For the past six or seven years here in Tokyo, if you flip on the TV, open a magazine, climb onto a train, walk down the street, or even use a vending machine, it is almost inevitable that you will encounter at least one member of the hugely popular aidoru (idol) group AKB 48. This group consists of far more members than their name suggests – in fact, officially AKB 48 has 87 members, but if the “trainees” and members of its sister groups are included, that number swells to well over 100. In addition to churning out pop hits, the most popular members of the group also endorse a huge variety of products: cell phones, shoes, canned coffee, cup ramen, purses and accessories, services for locating used cars, and even bras. Not only do they grace TV commercials, print ads, magazine covers, billboards, and in-train adverts, but they naturally have their own “goods” as well – trading cards, cheesecake photo gallery books, T-shirts, key holders, fans… the list goes on and on. While AKB 48 and other aidoru – and there is always a new girl or group appearing on the scene, most fading just as quickly as they appear – may have talent, being a talented singer or actress is not essential to their success. What idols do need to have, more than anything else, is beauty. All aidoru are packaged and presented to their adoring audiences as an idealized form of naïve, pure, innocent beauty. This idolization of beautiful girls and using them to attract customers in order to sell products is not a new phenomenon. While some sources will have you believe that the craze dates from the early ’70s, aidoru have existed in Japan for nearly 250 years and can be traced back to Edo and one individual in particular: Kasamori O-Sen.
By the time O-Sen was born in 1751, Edo had grown from a small swampy backwater to a metropolis of over 1,300,000 people – the largest city in the world. However, Edo was overwhelmingly male. Women were very much a minority, making up just 1/3 of the city’s population and so the object of much attention and desire. Owners of shops and teahouses in and around the temples and shrines of the city took realized that by employing a beautiful young woman, they could take advantage of this and attract far more potential customers to their establishments. Thus, the kanban musume (“poster girl”) was born. The most beautiful of these women becoming both lure and advertisement for the shop. O-Sen began helping out at her father’s teahouse, Kagi-ya, when she was 11 or 12 years old. 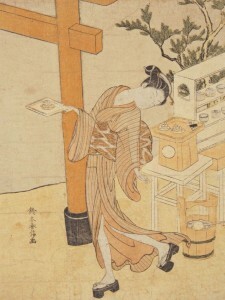 She worked as a chakumi-onna (“tea brewing girl”), preparing and serving tea, and was gained a reputation for being very good with customers. Even from this early age, O-Sen’s was becoming known for her beauty, and word of it began to spread. Kagi-ya was situated in front of a Kasamori Inari shrine, a Shinto shrine dedicated to protection from and prevention of skin diseases, such as eczema, as well as (and more commonly) “the pox” – syphilis. It is due to this shrine that O-Sen is known as Kasamori O-Sen. The Kasamori Inari shrine was itself a smaller shrine that sat on the grounds of Kannou-ji, a Buddhist temple located in a northeastern suburb of Edo called Yanaka. The temple is known as Tennou-ji today and sits in one corner of YanakaCemetery, just a stone’s throw from JR Yamanote Line Nippori station. Kannou-ji was a well-known and much visited temple in Edo. One reason was because it was home to one of the three legal lotteries in the city. The second reason was thanks to the presence of the Iroha Chaya (“the Alphabet Teahouses”) – teahouses surrounding the temple that catered mainly to the priests from Kannou-ji and other nearby temples and which were more brothel than tea house. O-Sen was soon to become the third reason for Kannou-ji’s popularity. 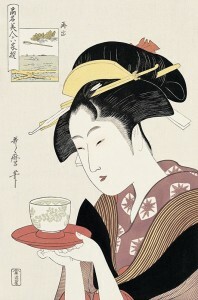 As she grew older, rumors of her beauty spread further throughout the city and in 1768, they reached the ears of Suzuki Harunobu, a woodblock print artist famed for perfecting the full color ukiyo-e prints whose popularity was sweeping the city. 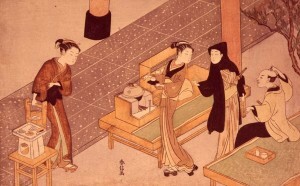 Harunobu visited Kagi-ya to see O-Sen for himself and was so taken with her that he made her the subject of dozens of his works over the next three years. There were many customers, both samurai and commoner alike, who made the trip out to see her and it was common knowledge that at a teahouse with a famed kanban musume, a cup of tea – normally costing just 8 mon (JPY200) – would cost 50 mon, or even 100 mon (JPY1,000 ~ JPY2,000). Then at the peak of her popularity, O-Sen disappeared. One day in the second month of 1770, she was simply no longer seen at Kagi-ya, and her father said he had no idea where she was. Rumors rippled through the city; some said she had been murdered, or had committed suicide. Others that she had run away or eloped. Still others said that she had been kidnapped or even spirited away by the gods. Whichever it might have been, Edo’s top aidoru vanished from the spotlight. It wasn’t until many years later that O-Sen’s fate was discovered. She had neither met an ill-end nor taken her own life. She had gotten married. Her husband was an O-Niwaban, a member of the Shogunate’s security and intelligence gathering force – essentially, a secret agent. His name was Kurachi Tadanosuke, and he was the son of one of the eighth Tokugawa Shogun Yoshimune’s 200 most trusted retainers. Because Kannou-ji was home not only to the enormously popular lottery, but also where so many teahouses were situated, it is natural that rumors circulating in Edo could be heard here – an ideal place for information gathering. Tadaosuke’s father, Bunzaemon, was given an estate close to the entrance of the temple, and it is likely that Tadanosuke met O-Sen there. It is also likely that it was due to Tadanosuke’s skills at evading attention that he and O-Sen were able to disappear and live the rest of their lives in private, in a small estate just outside the inner moat of EdoCastle, in the area of what is now HibiyaPark. However, because of the differences in their social classes – he was a high level samurai and she the daughter of a farmer – getting married was officially forbidden. There were ways around this obstacle, though. If a commoner could find a member of the samurai class to be her kari-oya (foster parent), then as an “adopted child”, she would be able to marry a member of the samurai class. Baba Gohei, the chief of the Gates of the West Keep of Edo Castle, agreed to act as O-Sen’s foster father, and she thus able to marry Tadanosuke. They had nine children (some accounts say 10), and she lived until the age of 77, passing away in the tenth month of 1827. O-Sen is buried next to her husband in the Kurachi family grave at Shouken-ji, a Buddhist temple located in Tokyo’s Nakano ward. 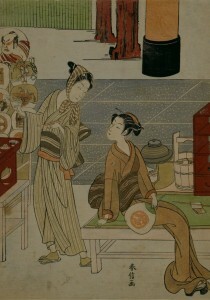 Despite O-Sen’s disappearance, kanban musume continued to attract customers to shops and teahouses in Edo. 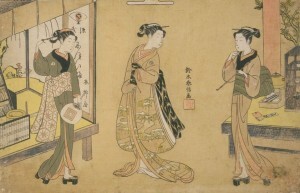 Thirty years after the fame of the “Three Beauties of Meiwa”, O-Kita – one of the “Three Beauties of Kansei” – became the subject of Kitagawa Utamaro’s ukiyo-e prints and like O-Sen rose to superstar status. While most aidoru are not of legal drinking age, even those that are do not appear in such ad campaigns; it would go counter to the their image of wholesome purity. However, that doesn’t mean that once an aidoru “graduates” (leaves the aidoru group or decides to change her image), they won’t capitalize on their popularity. Currently, the most notable of these is Maeda Atsuko, a former “No. 1” member for AKB 48, who is now solo and has become a poster girl for Sapporo’s Mugi to Hoppu beer. Nothing pulls in the punters like a pretty face, as O-Sen was likely all too aware. If she could see Tokyo today, I wonder what she would think? NOTE: The kanji used for her name (笠森”hat forest”) are different from those used for the shrine (瘡守 “pox protection”), but they are still pronounced the same. The second was at Yushima Tenjin, just south of Shinobazu Pond in Ueno, and the third at Meguro Fudou, located in the far southern part of Edo. The others were O-Yoshi, who worked at the Tsuta-ya teahouse in Asakusa, and O-Fuji of the Yanagi-ya toothpick shop, also in Asakusa.